The rise of all women IS the rise of the nation. A majority hard-right justice on the Supreme Court bench threatens to disassemble the patch-work laws protecting women's rights. We need the ERA to pass to give us equality under the constitution. An explosion is coming and it is not for equality. Read Washington Post columnist Dana Milbank opinion piece here. 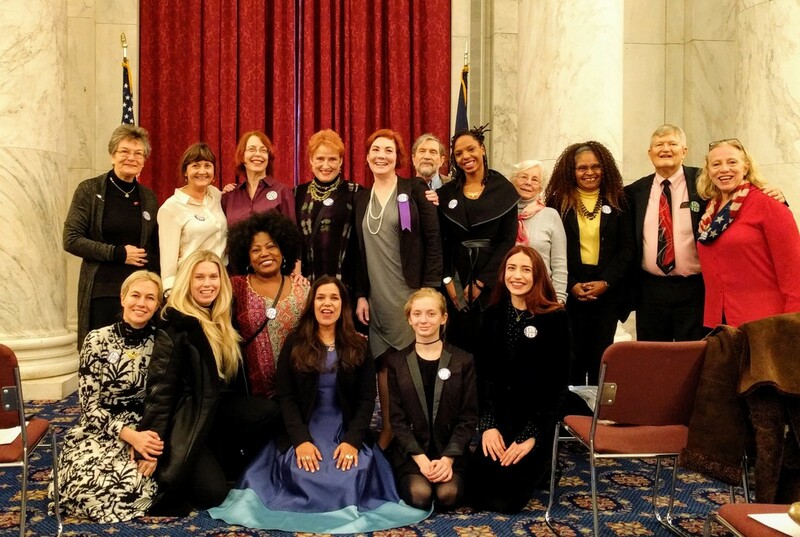 The work we did in DC on Monday January 23, 2017 ERA Lobby Day worked. We pushed the needle and made a real impact. 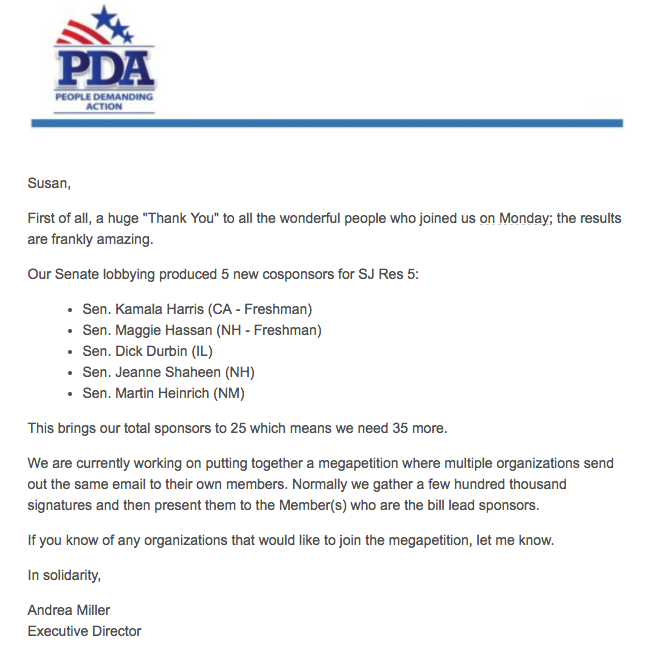 Our Senate lobbying produced 5 new co-sponsors for SJ Res 5 to REMOVE the DEADLINE - see letter below from Andrea Miller where she extended a personal thank you for organizing these events. I forward that thank you out to each of you that helped us to get this done. NOTE: THE GOVERNMENT LOCKED RUSSELL SENATE FRONT DOORS DURING OUR MEETUP TIME. WE'RE SORRY IF YOU COULDN'T FIND YOUR WAY IN. LESSON LEARNED - NEXT TIME, WE'LL STATION LIVE RECEIVERS AT THE DOORS. * see 1-23 speaker lists, preparing for lobby day during 1-22 Sunday luncheon. Unsure of what this means? Google "nations and women's rights" and see how inequality affects the world and your home. 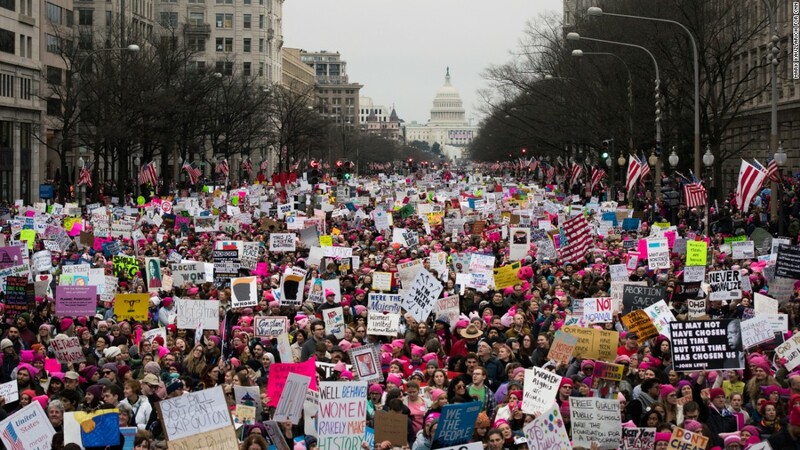 If only half of 0.1% of people marching on Saturday stay until Monday to walk the halls of congress, we’ll swarm the halls and they''ll hear loud and clear, "We’re sick of this BS and we’re not going to take it anymore. Women need constitutional equality!" I promise you this, once the bedrock is laid down, all this legal wrangling for our economic rights will be on a level playing field. ​We need to unify. United we stand, divided we fall. Let’s unite on equality, for once and for all. 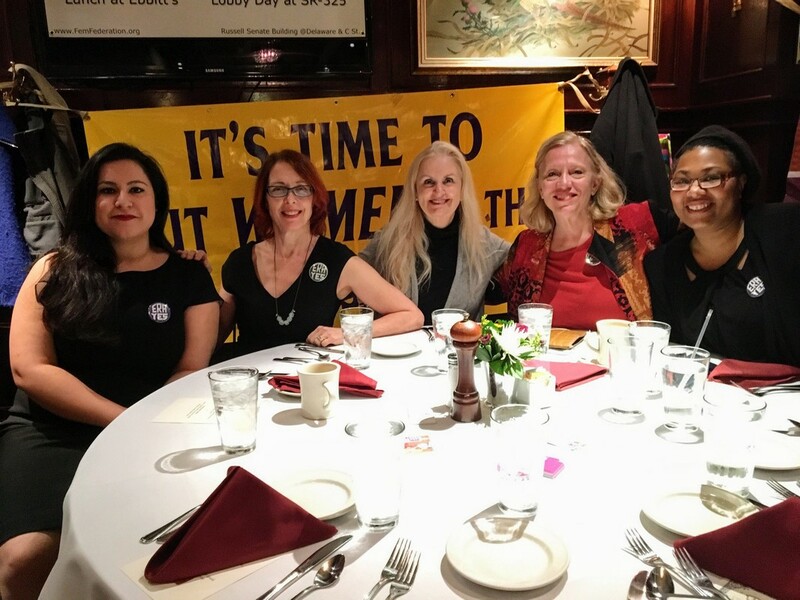 We are people who donate money, time, and travel to gain gender equity in our constitution.